Before you start to fence opponents, it is recommended that you make sure you have vets as crew. If only few shipboys in the pub, you can make seamen and vets appear, by pressing pay for a round of rum. Learn more about making huge amount of vets here. 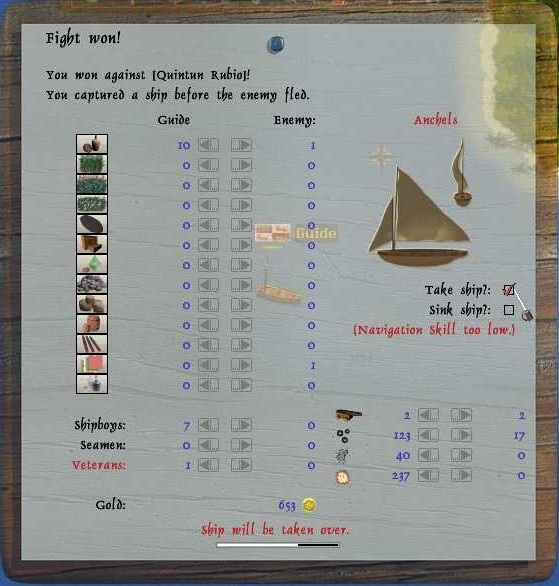 When at sea, you can see in the target window, what the ship you intend to board has, the target window is under the mini map to the right of your screen. You can change target with T or the key you selected in options. 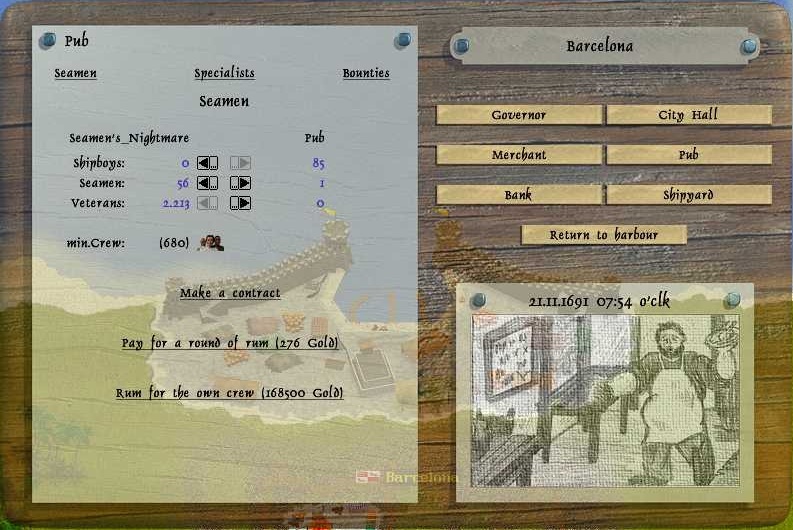 The little ship indicates how many ships it got compared to you and the crew indicates how much crew compared to you. +3 the opponent has more than three times as much than you. +2 the opponent has more than twice as much than you. 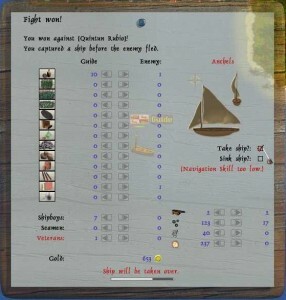 +1 the opponent has slightly less crew or under twice as much than you. -1 the opponent has slightly less than you. -2 the opponent has less than 2/3, as much than you. -3 the opponent has less than two times as much than you. It is recommended to only board opponents, which is -3 in crew compared to you, when you are a newbie. To board an opponent and start a fence, you need to press 3 for fence mode or the key you selected for it in options. 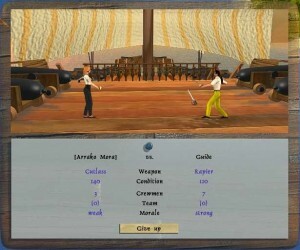 You then need to sail into the opponent, there then will appear a red ring, indicating fence will start soon, unless you and the opponent get away from each other so the ring disapear. When fence starts you get a window like this where you can choose what sword to fence with. Rapier is fast, sword is bit slower, but do little more damage and cutlass is slow, but does the most damage. 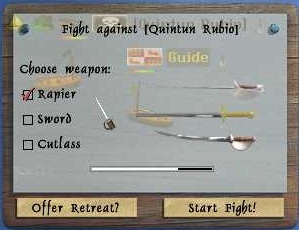 Against npc’s rapier is recommended. You press start fight to start fight right away. You can also offer retreat, but you will only get retreat, if your opponent also retreats. 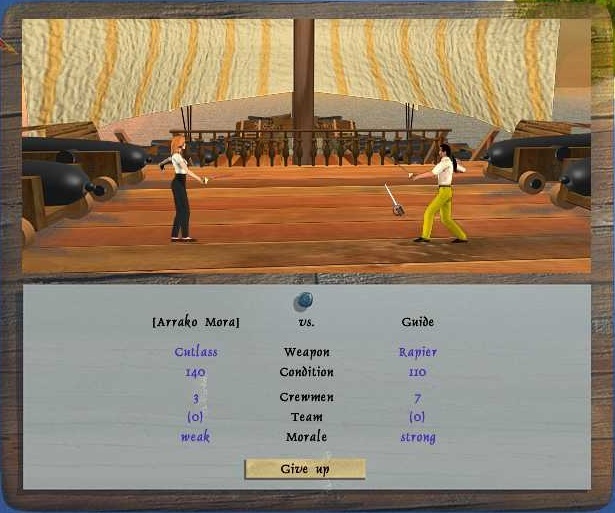 When the fence starts, you will be able to see your opponent’s sword, condition and crew. 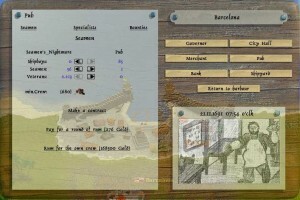 You can use the arrow keys or the keys you choose in options, to walk forward or backwards. You use left mouse button to stab and right to block or the keys you chose in options. You can move your curser to stab in head, stomach or legs, hitting stomach do most damage. If you block, you can only block up or down. This is mainly used when your condition is getting low, but you have more crew then the opponent as at each shoot you hear crew will be killed. So basically you can kill his crew by blocking and he will be crying in the end and one stab can win you the fight. When fencing an npc, then at the beginning of the fence, you can walk almost to the middle of the screen, then stab him one time, press step back before he stabs you, then stab him again. Keep stabbing and step one back, till you cannot step back, then just keep stabbing. 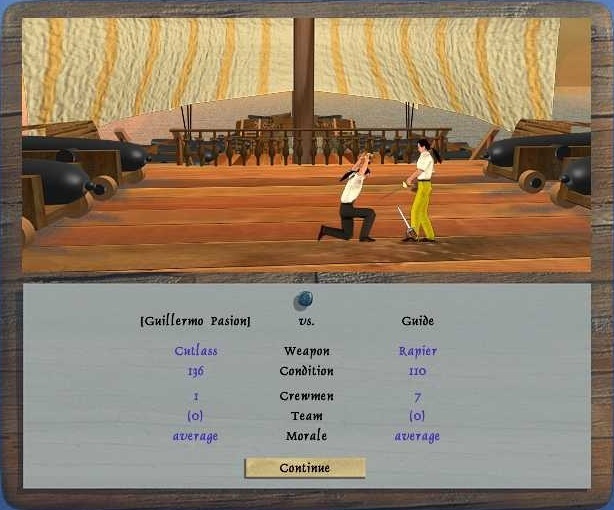 This is most easily done if the opponent uses cutlass, if he uses sword it is bit hard and if he uses rapier, it can be hard to do at the beginning. When the fence ends, with one surrendering, the give up button turned into a continue button and if you won you get option to take goods, crew, weapons and the ship. You can click over the stuff you like to take and press take goods, or you can press take all. If you get a red warning under the ship saying navigation skill too low, you might not want to take the ship, but if you already started transfer, you can still untick the take ship or tick the sink ship, as long you do it before transfer is over. Note that if you are on fence mode, you can be shoot and sunk before fence ends and if your opponent is not on fence mode, he or she cannot be shoot. Fencing a player is nothing like fencing an npc.